Jayson Woodbridge, owner of Hundred Acre, is a renegade vintner who Robert Parker describes as 'one of the wine world's most compelling, outspoken, irreverent, bigger-than-life personalities, who can get away with just about anything he wants to say or do simply because year after year he proves what great wine is all about'. Since his first vintage in 2000, he has consistently produced the most opulent, the most luxurious, the most critically revered, and the most wanted wines in the Napa Valley. Parker has bequeathed a bevy of 100 point scores to his wines, making for a wait list that is over five years to acquire them from the winery. In 2013 the single vineyard wines Kayli Morgan, Ark, and Few and Far Between received 100, 97 and 100 points respectively from Robert Parker, which came a year after getting 99, 100 and 100 in 2012. Never one to rest on his laurels, Woodbridge over the last ten years has been working on a surreptitious project, obsessively tasting and scrutinizing each and every single coveted barrel from his three prized single vineyards, looking to find perfection in what Aristotle philosophized as the whole being greater than the sum of its parts. After years of failing to create his personal pinnacle of perfection from these wines, in 2013 his vision came to fruition. Today we are sincerely honored to offer Woodbridge's 'Holy Grail' wine ~ Wraith. 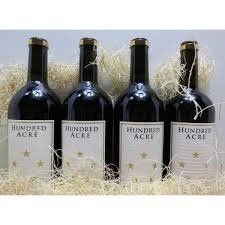 Hundred Acre Wraith is an extraordinary micro blend from barrels coming from perfect scoring vineyards and wines. Unabashedly voluptuous, this boasts layers upon layers of rich, lush dark fruit with integrated exotic spices, roasted vanilla, creamy caramel, sweetly charred wood, and pencil shavings. The mouthfeel is stunningly opulent with structured yet silky, polished tannins and an extraordinarily long finish. Knowing the pedigree of wines that Kayli Morgan, Ark, and Few and Far Between Vineyards have produced in years past, it is undoubtedly certain that once this gets into the glasses of wine critics and of yours, it will be praised as one of the best Napa Cabernets of all time.